Tour the Arizona Memorial, USS Bowfin, and USS Missouri in a small group setting. Lunch and Admission included. A full day tour featuring Pearl Harbor and the highlights of Oahu. Lunch and Admission included. An exclusive, VIP tour of all four Pearl Harbor sites. Customize your tour experience to see all of the sites you are interested in. Build your experience today! On the way to Pearl Harbor we may drive through the National Cemetery of the Pacific or Punchbowl. During the war the crater was used as a rifle range and home to 6 inch Naval Gun and to anti-aircraft emplacements (Battery 104) as part of Hawaii's shore defense system. In 1948, three years after then end of WWII, the congress approved funding and construction of the cemetery commenced. Today Punchbowl serves as the final resting place for over 13,000 that served in WWII. Customers picked up from locations other than Waikiki will skip Punchbowl Cemetery. Commercial vehicles are not authorized to stop at the National Cemetery of the Pacific. The cemetery may be skipped depending on traffic and pick up time. On the way to and Inside the park, our guides will orientate you with the surroundings and give you a detail analysis of the events that happened on 7 December as well as the events that lead up to the attack on Pearl Harbor. Our guides will help you answer the ultimate question, "Why did Japan attack Pearl Harbor?" The Arizona Memorial program consist of a 23-minute video followed by a harbor tour via Navy ship. On the harbor tour, you will have an opportunity to see the sunken Memorial and Battle Ship Row. From this vantage point you will be able to see the USS Missouri and the mooring quays marking the location of Battleship row and the active military fleet. Guides will not be with clients during this portion of the tour. The USS Bowfin Submarine, the Submarine Memorial and the Submarine Museum are located adjacent to the Pearl Harbor visitors center. The USS Bowfin Submarine was commissioned in 1942 and served 9 patrols in the Pacific before being decommissioned, transferred and transformed into a museum in 1979. The USS Bowfin is known as the "Pearl Harbor Avenger," and is one of only 15 remaining submarines from WWII. The Bowfin sunk 44 enemy ships during WWII including a bus. Visitors can walk through the submarine and see what life was like for 80 crew members and their officers. Age Restrictions: Children under 4 are not allowed on the USS Bowfin. This is a unique opportunity to explore the Bowfin Submarine with a former Commanding Officer of a U.S. Navy Submarine. This will give you an opportunity to learn the inner workings of the submarine, and gain a sense of Submarine life in our active Navy. There is an additional charge for these tours. This tour is $600.00 plus tax in addition to our hourly charges. Maximum number of 6 individuals. Age Restrictions: Children under 4 are not allowed on the USS Missouri. A unique, 90 minute tour of the USS Missouri gives you special access to sites within the famous battleship. Explore the engineering spaces, the 16 in guns, the Damage Control Central Station, the Broadway, the Fire Room #4, and the Aft Battery Plot Room. Please note that this tour is physically strenuous and it is not recommended for those with mobility constraints. You must be able to climb ten sets of steep, narrow stairs, step over more that 12 two foot high obstacles and navigate through tight doorways and low overheads. Guest must be at least 10 years of age to participate. Groups are limited to 10 guest per slot time. Times slots are at 0900, 1000, 1100, 1200, 1300, 1400. If you are not interested in buying out the entire Heart Tour, then we can join others signed up for during that time slot. These tours will have to be coordinated well in advanced. The cost of a VIP Private Heart of the Missouri Tour is $500.00 plus tax. Age Restrictions: Children must be at least 10 years old to participate in the VIP Private Heart of the Missouri Tour. All guest are required to go on the 35-minute docent tour. Each group consist of 10 to 25 individuals. This 35-min tour allows the USS Missouri staff to control the flow of individuals walking onto the ship. Our guides also participate in the docent lead 35-min presentation. Followed by the presentation, we will explore the ship together. Individuals wanting to make this first 35-minute presentation private, then the USS Missouri requires a buy out of 25 adult admission or $759 plus processing. The difference is a one-on-one experience with the docent for the first 35-minutes. What is at the Pearl Harbor Aviation Museum? The Pearl Harbor Aviation Museum sits on the historic Ford Island. These World War II hangars still bear the scars of our nation's first aviation battlefield and rank as the #8 aviation attraction in the nation. There are two hangers with planes as well as the helicopters that were used in WWII, Korea, Vietnam, Panama, Afghanistan, and Iraq. Math Alive, a traveling educational center sponsored by Raytheon, will be on site until November 2019. Hear the untold stories from experience pilots and aviation crew on with a Pacific Aviation Museum docent. All the history and thrilling aviation feats explained in detail. An exclusive, private tour of the Arizona Memorial and USS Bowfin Submarine in just 4 hours. This private tour accommodates individual groups of up to 7 persons. Transportation and admission to sites are included. Morning and afternoon tours available (8AM and 1PM start times). The Arizona Memorial is symbol of The United States involvement in WWII. It is the final resting place where we honor the sacrifice of 1,177 men, as well as honor those who continue to protect the constitution against all enemies both foreign and domestic. The USS Bowfin Submarine was a WWII instrument of war. It was launched December 7, 1942 and is know as the Pearl Harbor Adventure. Find our what it was like to live and fight on a submarine during WWII. We will guide you throughout the park with the exception of the Arizona Memorial. At the Arizona Memorial, you will watch a 23-min video followed by a Navy Harbor Cruise around the Memorial. The approximate time is 60 minutes. Our guide will then meet you at a pre-determined point to continue the tour. Age Restrictions: While there is no age minimum to book this tour, children under the age of 4 are not allowed on the USS Bowfin. During this time, the child and guardian can enjoy the submarine museum. An exclusive, VIP tour of the Arizona Memorial and USS Missouri Battleship. This 6-hour private tour accommodates individual groups of up to 7 persons. Transportation and admission to sites are included. The tour begins with hotel pick-up at 9:00AM. At Pearl Harbor, our expert guide will orientate you with your surroundings and give a detailed history of the world events leading up to the attack on December 7th, 1941. First, you will visit the Arizona Memorial, the final resting place of 1,177 men who bravely lost their lives during the attack. At the Arizona Memorial, you will watch a 23-minute video, followed by a harbor cruise around the memorial for viewing. Guides will not be with groups during this portion of the program. Afterwards, you will drive onto Ford Island. Our guides have exclusive access. At the USS Missouri, our guide will familiarize you with the ship's history, massive capabilities, and weaponry while walking around through this living museum. We will venture below deck to see what life was like at sea. See if you have what it takes to hold command of the ship on the bridge! 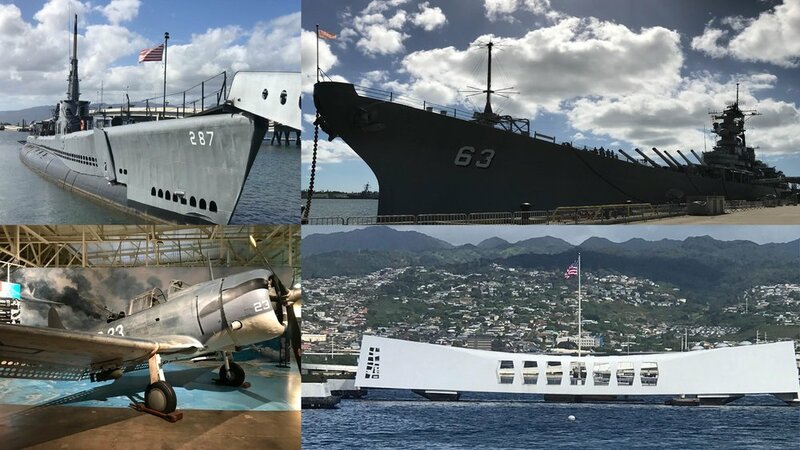 Join us on an exclusive, VIP tour of Pearl Harbor featuring the Arizona Memorial, USS Bowfin Submarine, USS Missouri, and the Pearl Harbor Aviation Museum. Combat Veteran owned and operated, Keawe Adventures will introduce you to Pearl Harbor with unmatched caliber and camaraderie. All tours are lead by knowledgeable and professional military veterans and local historians, who will enhance your visit with their experience and perspective. This is an 8 hour tour designed for private groups of up to 7 individuals. Roundtrip transportation in a private SUV will be provided from Waikiki or Koolina Hotels. Tour groups will not be combined. The listed price includes admission to the Arizona Memorial, USS Bowfin Submarine, USS Missouri, and Pearl Harbor Aviation Museum. Upgrade this tour with VIP add-ons for an experience you will never forget. Choose from: USS Bowfin Private Captain’s Tour, Private USS Missouri Tour, Private Aviator’s Tour, or VIP Guide Service by Makani Christensen (Owner of Keawe Adventures). Visit the Arizona Memorial, USS Bowfin Submarine, and USS Missouri with an expert, veteran guide in a small group setting. Tours are 6 – 7 hours long and accommodate groups of up to 7 individuals. Transportation, admission, and hot lunch included. Hotel pick-up between 8:30AM and 9:00AM. The Arizona Memorial is symbol of The United States involvement in World War II. It is the final resting place where we honor the sacrifice of 1,177 men, as well as honor those who continue to protect the constitution against all enemies both foreign and domestic. The USS Bowfin Submarine was a WWII instrument of war, launched on December 7, 1942. it is now known as the Pearl Harbor Adventure. Find our what it was like to live and fight on a submarine during World War II. Our guides have exclusive access to Ford Island, where you will visit the USS Missouri- The last battleship ever built and the site of Japan's official surrender at the end of World War II. Age Restrictions: While there is no age minimum to book this tour, children under the age of 4 are not allowed on the USS Bowfin. Visit Pearl Harbor and tour the island of Oahu in a small group setting. Transportation, admission, and lunch are included. The tour will feature historic sites, island history, iconic landmarks, local food, and scenic view-points. Combined tour groups are limited to 8 individuals per vehicle. This tour is 10 – 11 hours long. Pick-up from hotel between 6:30AM and 7:00AM. All tours are led by expert tour guides, who are military veterans or local historians with close ties to the community and vast knowledge about Hawaiian history and culture. Take a step back in time and visit sites that changed Oahu's landscape and created a defensive perimeter around Oahu. You will see remnants of shore defenses that protected Honolulu Harbor and Pearl Harbor, and military runways consumed by time. The tour will continue with a scenic drive through the center of the island where you will see towering volcanic mountains, rolling hills, and open fields. Take a tour of the 7-mile miracle at the North Shore, where we will visit famous beaches and iconic surf spots. Try the world-famous garlic shrimp and fresh fruit from a local tropical fruit stand. Continue on a scenic-drive down the East Coast, offering picturesque views of the Pacific. Other highlights include a macadamia nut farm, Valley of the Temples, Pali Lookout, and much more. Important Note: We are currently working on a way to book this tour online. For now, please Contact Us to inquire. We are excited to build your custom adventure!